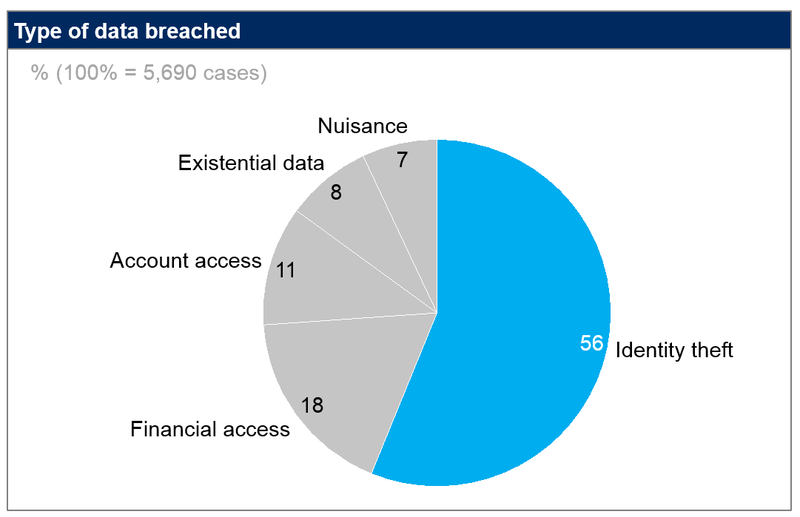 What’s in a data breach? We’ve all heard about some pretty scary data breaches: the Yahoo breach that compromised 3 billion accounts, the Ashley Madison breach in 2015 that left millions with a lot of explaining to do, and, of course, the recent Equifax hack that exposed over a hundred million social security numbers, probably including yours. Unfortunately, data breaches — large and small — occur every day and are increasing in frequency. Who’s actually carrying out the breaches, and what information do they typically steal? That’s right. Nearly a quarter of data breaches are accidental, self-inflicted occurrences by companies who clearly struggle to maintain healthy cybersecurity practices. Enterprises can ill-afford to be their own worst enemy, when the world is full of malicious outsiders already trying to trigger breaches (60% of the breaches in our study). 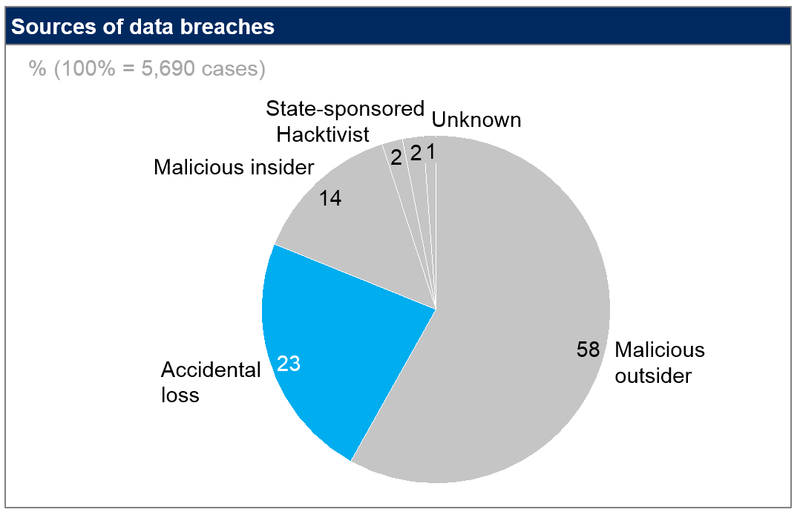 Equally surprising is that few of the breaches are triggered by state-sponsored actors (2%) or self-proclaimed “hacktivists” (2%), despite the significant media attention. Comparing the type of information breached reveals that identity theft is what is most valued, accounting for nearly 60% of all breaches. Other types of data compromised include information related to financial access (18%), account access (11%), and existential data (8%). Cross-referencing the type of data breached with the source of data breaches also reveals key insights into how different groups prioritize different types of data. 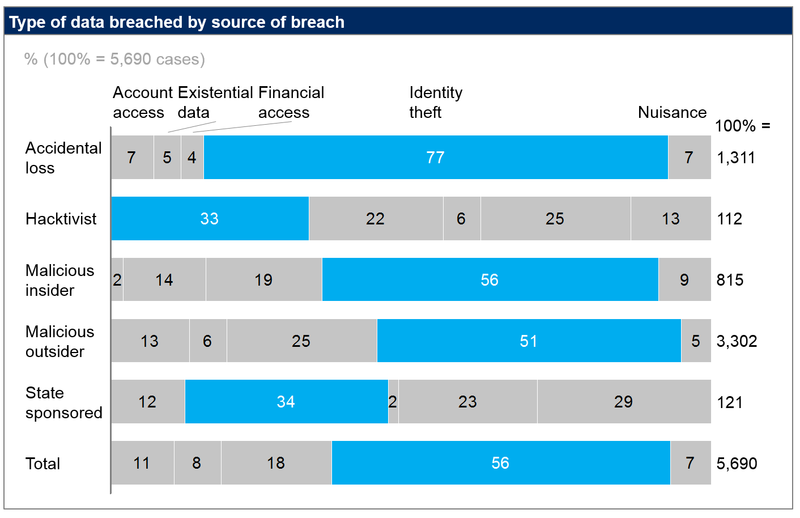 Identity theft data is what malicious sources sought most frequently (52% of breaches); state-sponsored breaches prioritized existential data (34%); while hacktivists most-often sought account access data (33%). Data breaches occur across all industries, but some are more susceptible than others. 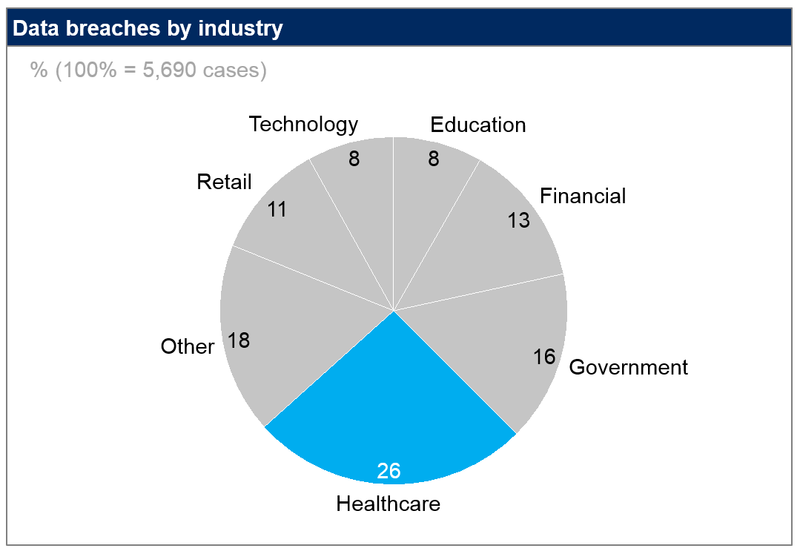 Yes, healthcare experienced the highest number of breaches in our data set, accounting for about 25% of all cases. This shouldn’t be surprising, given the fact that healthcare-related organizations tend to capture significant amounts of personal data relative to organizations from other industries. Government-related organizations rank a distant second (16%), followed by financial institutions (13%), and retail enterprises (8%).